My business travels recently took me to Arkansas... someplace you'd never know was a huge hub for business! Since Walmart and Tyson are headquartered in Arkansas, TONS of companies have outposts in the area; basically, anyone who would ever have contact with those two companies has an office. Business travel isn't glamorous. Because air travel isn't glamorous anymore. You fly, get a rental car, stay a night in a hotel, and eat at whatever restaurants are on hand. I don't know what I expected from Arkansas, but I do know what I liked... Whole Hog Cafe. President Bush (W) ate at the one I went to, and the Pulled Chicken Sandwich I had was top notch. The tables have six kinds of sauce on them. It's so good that Fodor's "Don't Miss" list for Arkansas... so good thing I visited, right? 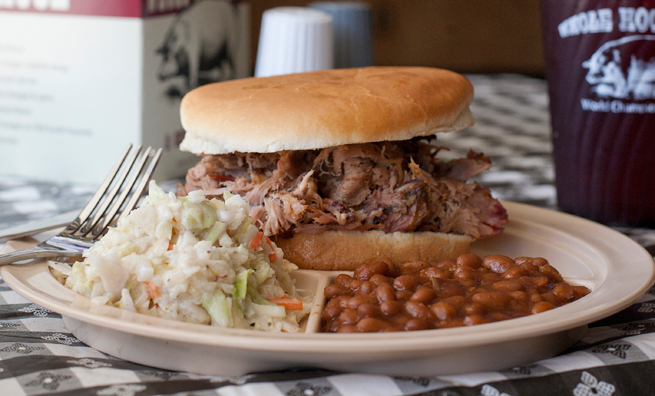 It's won Arkansas Times' reader's choice for best BBQ since 2001, without missing a year. I had the pulled chicken sandwich, and it was Southern heaven. All I can say is, YUM. Finger-lickin' yummmmmmmm. Business travel isn't glamorous... but at least that means you can lick BBQ sauce off your fingers.